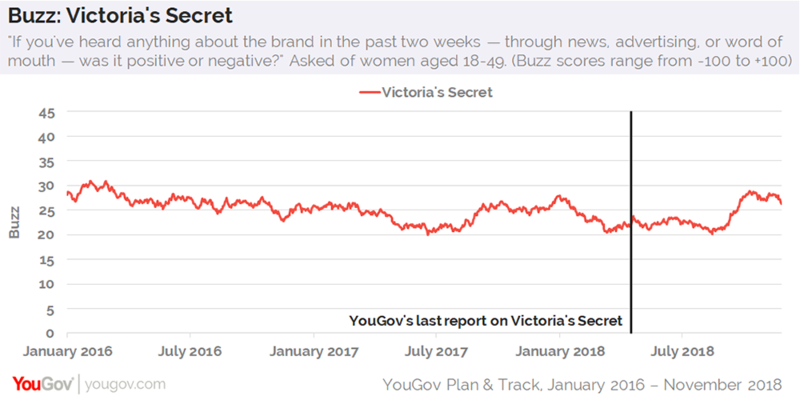 Since YouGov’s report on Victoria’s Secret last April, new numbers from YouGov Plan & Track reveal that consumer sentiment toward the lingerie brand has improved among US women aged 18-49. The good news comes as ABC prepares to broadcast Victoria’s Secret’s annual fashion show later this weekend, and amid leadership changes within the brand’s lingerie division. 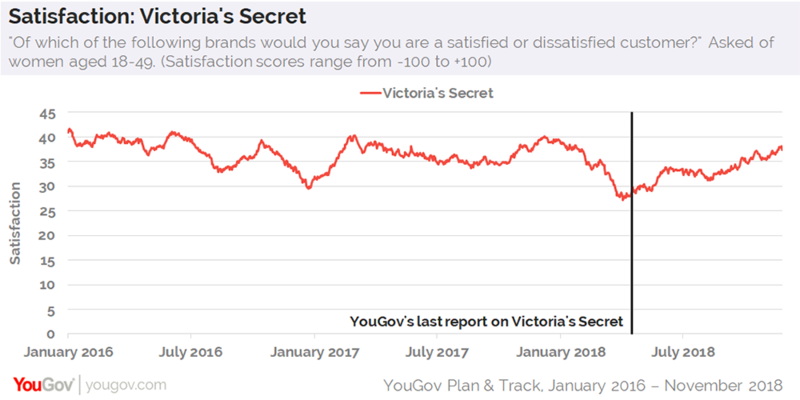 Victoria’s Secret’s Buzz score – which measures whether consumers are hearing something good or bad about a particular brand – has climbed from 23 in mid-April to a high of 29 in early October. Following some controversial remarks about women made by parent company L Brands’ Chief Marketing Officer, Ed Razek, during an interview with Vogue, the brand’s Buzz score has dropped to 26. Meanwhile, the amount of women aged 18-49 who say they’ve recently purchased clothing and apparel from the brand has gradually increased to 24%, up from 17% in mid-April. Satisfaction scores are up, too. Asked whether they consider themselves either a satisfied or dissatisfied customer, YouGov’s last report on Victoria’s Secret indicated that the brand had a score of 29 among women aged 18-49. At present, that number has increased to 37. One possible factor in Victoria’s Secret’s improving perception is that the #MeToo movement, which the New York Times reports has toppled over 200 men in powerful positions, isn’t as prevalent in the headlines as it once was. Indeed, recent figures from parent company L Brands show that while Victoria's Secret's overall comparable sales are currently down 1% so far in 2018, they were down 11% during the same period last year.